Amid all the discussion about self-publishing we can forget that each decision to publish is a specific, unique, and very personal calculation. You are an authority in a niche field. Some authors are well known in a field that is small and easily reached through affinity magazines, on-line forums, or professional circles. With access to the likeliest market for your book and existing authority, self-publishing might be the most profitable avenue for continued sales to this type of audience. You are a consultant to business or government. Many worthwhile books on a subject of narrow interest are published by business consultants both as an alternate revenue source, but also as a way to supercharge their reputation within their field. You are an established author trying to break into a new genre. 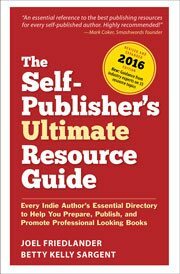 Authors who have been pigeonholed as “non-fiction” writers or “how-to” producers can face an uphill struggle to sell any other type of book to editors. Some authors have self-published, using their existing publishing platform to establish sales, and therefore interest, for their new genre. You are an activist with a passion for a cause. Activist authors usually have two assets that make them great candidates for self-publishing: an organization to promote their cause, and the passion that makes them spokesmen for that cause. The support of an organization, or just the assured sales to legions of followers make the economics of the publishing decision easy to calculate. You are a novelist, short-story writer, or a poet. The vast majority of these authors will never receive a contract for a book in their lifetime. Self-publishing allows an author to see their work in print in a way they can share it with the world, which is the driving force for many writers. Many of these authors have flocked to so-called self-publishing companies on the web to realize their dreams. When I made the decision in 1986 to publish Body Types it was for many of these same reasons that I’ve written about here: I had some expertise and a good deal of authority in this very niche subject, which was known to only a few thousand people, all of whom I knew. What’s more, there were no books on the subject in print, and nothing had been written at all on the subject for many years. In promoting Body Types I became an authority on a new branch of study, no matter how miniscule. The book established a place in the market, getting reordered year after year. Eventually it went through two editions and four printings, profitable from the first printing. I was invited to teach at holistic centers, events and conferences. I would be interested in your reason for publishing, or the discussion you have with yourself when you think about becoming a self-published author. I am looking into self publishing a book I have written, non-fiction. I don’t have much money.I have read if you put in on a blog, it needs to be in perfect form, edited. My book is not edited, so is there any suggestions you can give me? I don’t know anyone to edit the book & looking into self publishing companies has become over whelming! Thank you! I am exploring self-publishing options. I am overwhelmed. Can you offer any advice, even recommendations? I am interested in both digital and print publishing. Am looking, for instance, at Amazon for Kindle, Nook books, Lulu, CreateSpace, PubIt! and Smashwords. Are there any roads I should not go down? I’ve self-published before, and successfully I might add, but doing comic books. A story I was creating for my kids (Wanted Hero), which grew WAY beyond my original intentions. We had a great run of it, especially for not having a clue of what I was doing. Along the way we created 7 versions of our site, did 12 eComics (in PDF’s before there were readers), which turned into 2 graphic novels…and we ended up with readers in 60+ countries for a few years. We did rather well. It was our only income for over 2 years, and that’s saying a lot (I have 11 children). The funniest thing about this first adventure was, I didn’t DO research about printing/publishing/the industry (like I am with your site right now). I just had this passion to share the story that overpowered any opposition. Then I lost use of my hands and in depression (being a cartoonist was my life’s dream), I let everything go. Not being able to draw crushed me. I walked away and found another career. Yet my heart always ached and there was always that odd letter, email, phone call or conversation asking why I stopped creating Wanted Hero. Then it hit me: People wanted to hear the end of this story! I don’t know how many, but every odd request mattered. One email felt like hundreds. I had made a commitment to share something and I had not kept my word. So I’m working hard to bring the comic book to it’s full potential through a novel series. This excites me, because I’m able to take all my notes way way back to 1990 and incorporate them, which was impossible in a comic!! I don’t honestly know what will happen, Joel, but it’s the best story I’ve ever written and we’ve not met a soul who didn’t like it in some way–even those who’d never read a comic in their life. That has to say something, doesn’t it? It’s exciting to work side by side with my wife, churning out thousands of words a night and shaping a unique Universe with all its quirks and complex characters, events and adventures. Your site has been a true blessing to me Joel and I want to thank you for that. The information, guidance and resources are appreciated more than you know. I thought I was prepared to release Prelude to a Hero, but several of your articles stopped me in my tracks. Back up, adjust, refine. Why do I self-publish and why do I want to self-publish in a BIG way now? It’s very simple: I have a story that has already entertained thousands of kids and their parents with them. I know people want it, even if my audience is small right now. Self-publishing is the only path I know of that will allow me to do what I believe I was meant to do. Entertain youth in a unique and unforgettable way that shows them how great they are and the potential that awaits their self-discovery. Thank you Joel and God Bless. Jaime, that’s an incredible story and I want to thank you for sharing it. I think you’ve hit on a great way to move forward with your work and you really ought to concentrate on trying to build up your platform of people who are interested and following the work you’ve done before. I’m not surprised about how you proceeded in the past, since many self-publishers started the same way, with no idea that they were diving into the publishing business, but doing it in a kind of folk-art way, through self-education and trial and error, fueled by their passion for the subject. I hope you find what you need here, and if you have any questions about making the transition to books and print on demand, leave them in the comments and I’ll try to help out. Good luck with Prelude to a Hero, I bet it will be a big hit. I would like to learn how to get reviews for the books, but I’m not sure I can wait 4 months to publish some of these, so traditional means may not be an option. What would be your traditional route? Do you know about how to get to Book Bloggers? You coud try online book reviewer blogs. There are many and they don’t cost anything. An example is; http://yabookscentral.blogspot.com/ Each review site has a set of rules about what type of book they review. You send it electronically. Don’t confuse reviewer with editor – a reviewer will expect a finished edited product. Many give positive reviews or say something like ‘I was unable to finish this book.’ I just Googled ‘YA (young adult) book review blog’ and got loads. I have read a suggestion that you need to get a book reviewed a couple of months before it comes out so you can choose a couple of comments for the cover. Good luck. Thank you Christopher. I did just as you suggested and even got my son to help me by going through, reading the submission rules for each site and when we qualified, send a polite request for a review. It’s a lot of work, but it has been a good start. As for getting the quotes, I can agree…but since I was working on interior art for the printed book through Createspace, I got the quotes from the eBook reviews, then put them in the final printed version. Worked like a charm. Since i made my original post above, I’ve released a second book a few weeks ago, and the few that have reviewed it like it even better than the first! This is a VERY exciting adventure!! I’m glad Joel’s here to give tips and guidance.